A mustached mud bee, Anthophora abrupta. Every child knows bees live in hives, make honey, pollinate flowers, and deliver a sting if provoked. But if pollinating cranberries is the goal, there may be another, better-suited bee. Consider Anthophora abrupta, or the mustached mud bee, so called because the males use a pheromone-soaked mustache to woo females in the spring. "Solitary bees are valued only for their skill as pollinators," says Agricultural Research Service entomologist Suzanne W.T. Batra, who is at the ARS Bee Research Laboratory in Beltsville, Maryland. "They do make honey from nectar, but they make only a little. And they mix it with pollen and their own body secretions to make beebread for their young." Mustached mud bees are truly as American as the cranberries they may someday be used to pollinate. These native bees live in dry clay walls and cliffs, not in hives. The adults fly during early summer; the rest of the year, they live inside nests. They look like small, fast-flying bumble bees. Unlike honey bees, whose reproduction is a privilege for the queen, every solitary bee female has a chance at motherhood and the work of gathering food. 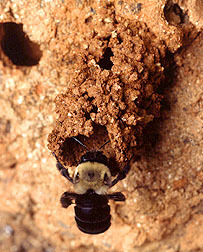 They are called mud bees because females build chimneys of mud at the nest entrances. Mud bees are not as likely to sting as honey and bumble bees. Harold E. Bechmann, who is with the University of Delaware, was helped by Batra with testing these bees as pollinators for cranberry bogs. He explains why they're more gentle than honey bees. "Mustached mud bees don't have the large investment of calories, pollen, and wax that honey bees put into a hive," Bechmann says. "A hive is a honey bee's life." Obviously, these bees were interesting to scientists, but would they be pollinating pros for cranberries? Wet, cold cranberry bogs do not seem like fun places for any bee, but mustached mud bees are active in June during cranberry bloom. The trick would be building up a large enough population and getting the bees to stay--in spite of the cold, dampness, and wind. Together, Batra and Bechmann gathered bees for the experiment. Some came from Bechmann's collection, which he found in an old stone farmhouse near Elkton, Maryland, that was built in 1735--when clay was used as mortar for homes. Batra gave him more bees that she found nesting in an old adobe chicken coop near Baltimore. "These bees are such homebodies," says Bechmann. "It's hard to get them to move to new manmade adobe abodes. The way they see it, what was good for the last generation of bees is still good enough for them." Batra gave Bechmann insights on making the bees more comfortable in their new homes. Wood posts supporting blocks of dry clay nests seem to work. The first year met with little success, the second year went better, and each year the bees seem more adept at life in the bog. "The land's flat, there're no trees, and the wind blows like mad," says Bechmann. "But I've checked mustached bees we've released in the bogs and, sure enough, the females had gathered cranberry pollen on their legs." Future yield data will show how effective these bees are as pollinators, Batra says. "Cost and ease of management will also be important factors." --By Jill Lee, Agricultural Research Service Information Staff. Suzanne W. T. Batra is at the USDA-ARS Bee Research Laboratory, Bldg. 476, BARC-East, 10300 Baltimore Ave., Beltsville, MD 20705-2350; phone (301) 504-8384, fax (301) 504-8736. "Cranberry-Pollinating Bee Wears a Mustache" was published in the September 1998 issue of Agricultural Research magazine. Click here to see this issue's table of contents.